Though Western Sahara's legal status is disputed, it is still possible to host and join international conference calls from or with Western Sahara attendees using our pay-as-you-go international conference calling service. All you need to host a Western Sahara conference call is an activated account and any type of phone. As long as your attendees located in Western Sahara have phone service, they can participate in your Western Sahara global conference calls. Although no country specific dial-in numbers exist for Western Sahara, we suggest using the included dial-out feature. To bring attendees into your call you would use the dial-out feature as describe here. The dial-out rate to call Western Sahara is the same as the Morocco rate. Our no contract international conference calling plan isa flexible choice for any person or business with contacts in Western Sahara, Africa, and the world beyond. Simply host global conference calls as needed and pay only for the minutes used. There are no monthly fees, no minimums, no penalties, and no commitments. We have the most useful advanced features, plus exceptional 24 hour operator assistance. Western Sahara is located in North Africa along the Atlantic coast. Currently a disputed territory, Western Sahara is bordered by the Atlantic Ocean, Morocco, Mauritania, and Algeria. The region was previously under Spanish control as Spanish Sahara until 1976. The northern portion of Western Sahara was annexed by Morocco soon after. In 1979, Morocco claimed the remainder of the region after Mauritania withdrew. However, the Polisario Front disputed Morocco's control, entering into a guerrilla war that ended with a cease-fire in 1991. The Polisario Front (Popular Front for the Liberation of Saguia el-Hamra and Río de Oro) remains focused on ending Morocco's presence in Western Sahara. It is also outlawed in parts of the territory controlled by Morocco. The United Nations stepped in with peacekeepers and a proposed referendum - a choice between independence or integration - that never materialized. Today, a sand berm built during the 1980s spans the entire length of the territory. According to CIA World Factbook, as of July 2013, Western Sahara had a population of 570,866. 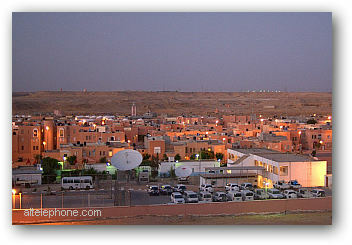 The economy of Western Sahara is administered by the Moroccan government which provides employment, funding, and infrastructure development in the territory. The economy of Western Sahara is based on phosphate mining, fishing and nomadism. Morocco and the Polisario often quarrel over the region's natural resources - and even the exploration of potential resources such as oil. According to CIA World Factbook, the telecommunications system in Western Sahara is "sparse and limited." It is tied into Morocco's telecommunications system by microwave radio relay, tropospheric scatter, and satellite via two satellite earth stations. An article on OAfrica.com, notes that Maroc Telecom secured over $1 billion USD to fund the development of a large telecommunications plan including a fiberoptic line running through the territory. Because Western Sahara is a disputed territory, statistics about its telephone, mobile phone, and Internet usage rates are unknown. 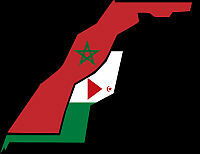 Presumably, the portion of Western Sahara controlled by Morocco would be served by operators licensed by Morocco. If your have a participant located in a country that is not listed on the access number list, the participant can still access and join your conference call using our local U.S. bridge number (provided upon account activation). Or, the moderator can use our dial-out feature to bring the participant into the conference call. Global Conference Calling with attendees located in Western Sahara are accomplished using the included leader dial-out feature.